Today LED has become an integral part of consumer electronics. LED TV, LED Display, LED Lights and so on. These are becoming very popular because of there low power consumption. A light emitting diode is essentially a PN junction semiconductor diode that emits a monochromatic(single) colour light when operated in a forward biased direction. Early LEDs were only bright enough to be used as indicators, or in the displays of early calculators and digital watches. More recently they have been starting to appear in higher brightness applications. LED and resistor are placed in series and connected to a voltage.As the voltage rises from 0v, nothing happens until the voltage reaches about 1.7v. At this voltage a red LED just starts to glow. As the voltage increases, the voltage across the LED remains at 1.7v but the current through the LED increases and it gets brighter. As the current increases to 5mA, 10mA, 15mA, 20mA the brightness will increase and at 25mA, it will be a maximum. This is just a simple example as each LED has a different CHARACTERISTIC VOLTAGE DROP and a different maximum current. In the diagram below we see a LED on a 3v supply, 9v supply and 12v supply. The current-limiting resistors are different and the first circuit takes 6mA, the second takes 15mA and the third takes 31mA. But the voltage across the red LED is the same in all cases. 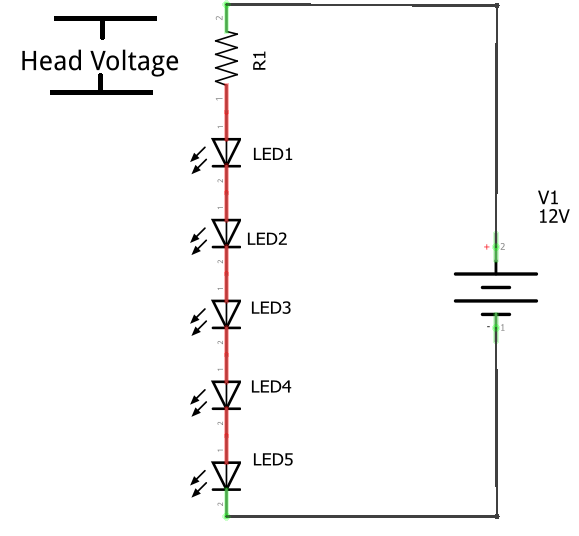 As the supply-voltage increases, the voltage across the LED will be constant at 1.7v (for a red LED) and the excess voltage will be dropped across the resistor. The supply can be any voltage from 2v to 12 or more. The resistor will drop 0.3v to 10.3v. This is called HEAD VOLTAGE. The voltage dropped across this resistor, combined with the current, constitutes wasted energy and should be kept to a minimum. Most supplies are derived from batteries and the voltage will drop as the cells are used. As soon as the supply drops to 11.8v, no LEDs will be illuminated. Suppose the current @ 12v = 25mA. As the voltage drops, the current will drop. Many batteries drop 1v and still have over 80% of their energy remaining. That’s why you should design your circuit to have a large HEAD VOLTAGE. ⟵How to remove windows default share? Why I said HEAD Voltage should be high, is that when battery discharges after some usage, your LED might not light up if current becomes zero. Having a High head voltage be ensure the circuit works longer with the specified battery. But yes, too high HEAD voltage will be wastage of energy. You need to select optimum head voltage – not too high and not too low.